This study investigates the origin of the attachment of metal droplets to solid spinel particles in liquid slags. Previous research hinted a reactive origin: the spinel particles form by a chemical reaction together with a new droplet or alongside a droplet that was already present in the system. In this study, a smelting experiment was used to investigate this hypothesis. For such a study of the mechanism, a simple chemical system was used to avoid complex reactions. 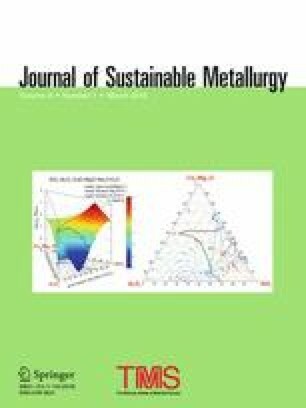 However, performing smelting experiments in simple slag systems requires an adaptation of the previously developed experimental methodology, resulting in a new ‘partial melting’ methodology. During the experiment, the atmosphere of the system was first set as oxidative, to dissolve the metallic copper in the slag and then a reductive atmosphere was used to actuate the reaction. Moreover, Ag was added to the metallic phase to act as a tracer element. The results show that the amount and size of copper droplets increase over the duration of the experiment. The fact that silver is present in the attached copper droplets in a smaller concentration than in the master alloy in this study indicates that the origin of the attachment is not purely dispersive, and either a purely reactive or a dispersion–reaction combination is possible, which confirms the hypothesis. The contributing editor for this article was I. Sohn. I. Bellemans holds a PhD fellowship of the Research Foundation - Flanders (FWO), and V. Cnockaert wishes to thank the agency for innovation by science and technology in Flanders (IWT, VLAIO, HBC.2016.0207). The authors also are grateful to the technicians and staff working at Umicore R&D Olen, for their help with the experiments.